This keeps the wiki clean of unused files. If you inputted text in the summary box when uploading an image, remember to edit the page afterwards and delete the text. This only applies if the image is a new upload that is not replacing an existing image. When using the Snipping Tool, remember to put ".png" after the file name. For a more general guide on 100% quality pictures, see here. For the full image policy, see here. You are not to upload pictures with mods being shown. This will result in the image being marked for replacement. However, if the item is an event or gachapon item, or a specific color when obtained from Fishing, killing a certain monster, or received from an quest/NPC, and it comes in specific monochrome colors (including black/white, or a single shade of color), you may take pictures and upload it in its respective image gallery. However, if the item is an event or gachapon item, or a specific color when obtained from Fishing, killing a certain monster, or received from an quest/NPC, and it comes in specifically in Black and/or White colors, you may take pictures and upload it in its respective image gallery. Avoid using bright colors that may transition into white under certain lighting conditions. Same applies for dark colors that may transition into black under certain lighting conditions. The only exception is if the image is being uploaded on your personal page, in which you monopolize yourself there. You will not to revert the image back to your image if it breaks the rules or replaced by a better version. If you are going to revert it, state a valid reason! If the reversion is done by an administrator, it is considered as a "final" reversion of sorts, but it can still be subjected to replacements if applicable. IF the image is lower resoultion but fixes the problem of the image, it is considered a valid replacement, despite being lower resolution and/or quality than its previous revision. Once you upload a picture, you will be responsible for any actions and/or consequences it may cause (Such as replacements, deletion, being asked to retake it, etc.). You can upload it as a placeholder however, but it will be replaced by an in-game version once it is localized for Mabinogi in the North American Servers. However, you are not to replace in-game images with simulator images. How to disable quest markers. The wiki prefers ".png" files over ".PNG" files, as most, if not all, the templates used on the wiki is of the lower-cased extension. Try not to upload pictures that are in your character's undergarments. Remember that there are people that are sensitive to this type of material. This especially applies to female characters, but generally applies to all genders of all races. Giants may pose without clothing due to some of the gauntlets having shoulder pads, which is obscured by most types of clothing/armors. There are some exceptions to this (See character weight). Please refrain from uploading Character Simulator images. As stated above, you can upload it as a placeholder of sorts, but be aware that it is subject to replacement. No gestures nor idle poses. They take away from the clothing and it usually becomes distracting. Clothing that has passive gestures, or idle poses, (see Berched Wear or Eluned Alchemist Suit (F)) can be uploaded, so long you equip something that does not appear in the character's hands, such as a Tailoring Kit or Metallurgy Sieve. When uploading Headgear, you may want to use an alternative hairstyle if your current hairstyle interferes with the headgear's details. This is usually under personal preference, but is recommended (see Pop Star Earrings for an ideal example). When uploading Shoes, try to avoid any clothing that has socks. Boots will usually cover the socks if the socks are small enough. Avoid clothing with stockings and/or high thighs as well. Some clothes clip the boots, while others remove anything above the ankle entirely. The Style Suit (F) is a prime example. When uploading gloves, do not strip down to gloves only. Wear something that shows your arms and keeps your character clothed, such as Popo's Shirt and Pants for Humans and Elves, or Newbie Wears. Try to avoid clothes with long sleeves, arm bands on the wrist,, or sleeves that cause the glove to distort anything that covers their forearm. For best results, turn off Outline Rendering. A one pixel wide outline is rendered if this option is on. This makes certain items grainy on low resolutions, and usually is unnecessary. The wiki prefers no Outline Rendering over Outline Rendering. However, there are exceptions. For an example where is Outline rendering useful, see Halloween Witch Robe. Indoor lighting is usually preferred over outdoor lighting. This doesn't mean that optimal daylight (12:00pm to 2:00pm/12:00 to 14:00) will stop you from uploading images, but the lighting is consistent indoors than it is outdoors. If you upload an outdoor image, it will be subject to replacement. On most new player accounts/new client installations, you may get random quest arrows and markers. To disable this, go into Options. Click the Game Tab, and then click on the Etc. sub-tab. Check the box next to "Hide Quest Info" and all quest markers on the map, the blue quest arrow next to your character's feet, and quest markers above NPCs will disappear as long as the box is checked. Open the menu at the bottom left corner of the user interface and click on "Options." The interface to the left shoes the full interfere. The one on the right is the compact interface. The best one is Summer Sea, but other interface colors work just as well. Do not use the gray or white interface colors! Open your inventory window with the "I" Key or click the Inventory button that is found at the bottom of the bottom of the client window with the full interface. Place the item you wish to make a screenshot of into the inventory grid. The reason for this is that putting certain items in your equipment slots will cause the inventory icon to shrink so that it will fit in the box. If the inventory icon has numbers to indicate how many is in a stack, you will want to right click on the item. If it is small enough, it will not be shrunk to fit in the box that appears. after right-clicking on an item. Open the snipping tool via the start Menu. Click and drag the mouse over the item in the inventory grid. Then copy the image and paste it into an image editing program such as Microsoft Paint, Adobe Photoshop, or something similar. Crop the image until only the item is seen. Click the taskbar and hit the Print Screen Button (often seen as "Prt Scr" or "Print Scrn"). Paste it into an image editing program such as Microsoft Paint, Adobe Photoshop, or something similar. Crop the image until only the item is seen. If you are afraid to crop details out, you can simply leave it in the inventory grid. Be sure to crop it so that all the squares can be seen. Save the image as a .png file with the same name (or close) as the equipment you are taking a picture of. Remember to leave somewhere for quick access. Upload it to the wiki and request a cleaning if you cannot clean it yourself. There are many people on the wiki that will be willing to clean the item, provided that it is deemed cleanable. This is recommended if you cannot clean it yourself. Put it into an advanced editing program such as Photoshop or Gimp to make transparent backgrounds and clean it yourself before uploading. You may have to have some experience before doing this. There are a few tutorials online on various websites on how to make transparent backgrounds. I would advise keeping a separate copy instead of editing on the same one just in case. Notice #1: The younger (or smaller) the character, the less detail gets shown! Try to have a character between the ages of 12 to 15. Notice #2: Some clothing is age restricted (such as Long Swordsmanship School Uniform (F) or Coco Panda Robe). If the bodygear is age restricted, it is recommended to take the photos at the proper age to prevent confusion of wearability. Notice #3: Some clothing are asymmetrical (One side is not the same as the other side. For a recent example, see Adorable Raccoon Outfit (Female)). It is recommended to take both sides, but it is usually unnecessary if the details are small (see Selina School Uniform). Go into Dunbarton School Library and stand in the center of the floor pattern in front of the statue. Enter Screenshot mode via the menu on the lower corner. Resize your client window to the largest area possible. Use the \ key to hide all windows. This prevents clutter on the screen. Turn off your glow effects. This will prevent fuzziness and it will be less distracting. Opening Options menu, go to the "System" Tab and click on the "Effect" sub-tab. Uncheck the "Glow Effect" option if it is checked. Alternatively, you can use the Asterisk (*)/Multiplication key on the number pad, found on the right hand side of the keyboard. Move your character towards the screen, but try to maintain the overall body! For proportion reasons, keep the head! Equip the item you wish to take a picture of. Take off all other items except the body gear. Move your character according to the template for bodygears as shown below. If the Bodygear has no socks or stockings, take it like this. If the Bodygear has socks or stockings, take it like this. Pro-Tip #1: Use the keyboard movement keys while holding shift so you don't have to keep zooming in and out and lose the position of your character. Pro-Tip #2: Using the Up and Down Arrows will move the camera vertically! This is very useful! This is the recommended method for those inexperienced with using the Snipping Tool. Click the taskbar at the bottom of the screen, or where ever you may have it located. Hit the Print Screen Button on the keyboard (often seen as "Prt Scr" or "Print Scrn" and usually located on the top row of keys). Open up MSpaint (Microsoft Paint) or a picture editing program such as Photoshop or Gimp. Crtl+V or Paste the picture into the program. Crop the picture to size. Don't cut off the head. Save the image as a .png file with the same name (or close) as the equipment you are taking a picture of. Repeat steps 1 through 6 until all the necessary angles are taken. Use the template above as a reference. Remember to re-position your character for the next view. Find the equipment on this wiki via the search bar, and click on the section of the template you want to upload/replace. If a file exists, you will be redirected to the file page. Scroll down and click on "Upload a new version of this file" if you are trying to replace it if an existing picture exists. Find the file in the folder you saved it and upload. Refresh the page after it is done uploading, and you have now made a successful bodygear upload. Thanks to Xcelled194 for bringing this to my attention. This is available for users of Windows Vista or newer only. The screen will turn white once you open it. Drag until you get the proper image size. After you select the area you want, you can save it right away. However you must manually type ".png" at the end of it. Otherwise, you can continue to the next steps for a proper ".png" file. You can repeat steps 2 and 3. To do so, press Ctrl+N while in the Snipping Tool with Mabinogi behind the snipping tool. Remember to re-position your character before doing so. Otherwise, you can continue on just to make a proper ".png" file. Copy the file into MSPaint or into an image editor such as Photoshop or Gimp. Click New on the Snipping tool window while the Mabinogi Window is behind it. 'Be sure to re-position your character for the next view before clicking "New." Then repeat steps 2 through 8 until all the necessary angles are taken. Use the template above as a reference. 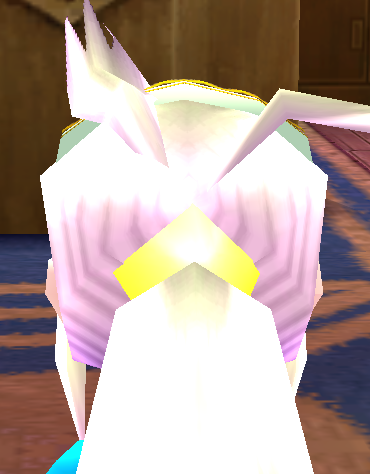 Notice #1: Some headgears are asymmetrical (One side is not the same as the other side. See Boatswain Pirate Bandana). It is recommended to take both sides, but it is usually unnecessary if details are small (See Vintage Dragon Felix Helm). Notice #2: Since headgear does not change in size depending on age, you can be any age to take the pictures. Camera will be a bit below the chin at taller heights. Notice #3: Try to find a hairstyle that exposes the forehead and shows your entire ear. This is highly recommended for circlet-type and earring-type Items. Notice #4: Do not pick hairstyles with an ahoge (Hairs that stick out from your head. See here for an example.) or with a ponytail that is above the head. This will obstruct some angled and/or back views. Notice #5: Avoid hairstyles that have bangs that covers the side of your head. This obscures side views. Move your character towards the screen. Using the Up/Down Arrow Keys, adjust the Camera. This is very useful for giants, as they are taller. Move your character according to the template for headgears as shown below. Hit the Print Screen Button (often seen as "Prt Scr" or "Print Scrn"). Refresh the page after it is done uploading, and you have now made a successful headgear upload. This is for Windows Vista and 7 Users only. Notice #1: This method will work with most shoes and some boots. Not all boots will work out with this method. Notice #2: Avoid clothing with socks and/or stockings. Some boots will cover the socks, but not all types. To avoid this, simply wear something that has no socks/stockings, such as Popo's Shirt and Pants. Using the Up and down arrow keys, adjust the camera until the camera is as close to the ground as possible. Using right-click, right click the ground until you can move the camera as close as possible to the shoes. You may have to move the camera up or down if the shoes cover above the ankle or goes up to the knee. Equip the shoes/boots you wish to take a picture of. Move your character according to the template for shoes as shown below. Crop the picture until your character's lower legs (i.e. below the knee) is only seen. Repeat steps 1 through 6 until all the necessary angles are taken. Use the template above as a reference. Refresh the page after it is done uploading, and you have now made a successful shoes upload. After you select the area you want, you can save it right away. However you must manually type ".png" at the end of it. Crop the excess of the picture until your character's lower legs (i.e. below the knee) is only seen. This page was last edited on 18 February 2016, at 08:25.